Every year as I put together the Must See Christmas Lights list, I get the opportunity to talk with many of the people who host the displays. I'm always impressed by how much planning and effort they put into transforming their houses into amazing displays for others to enjoy throughout the Christmas season. 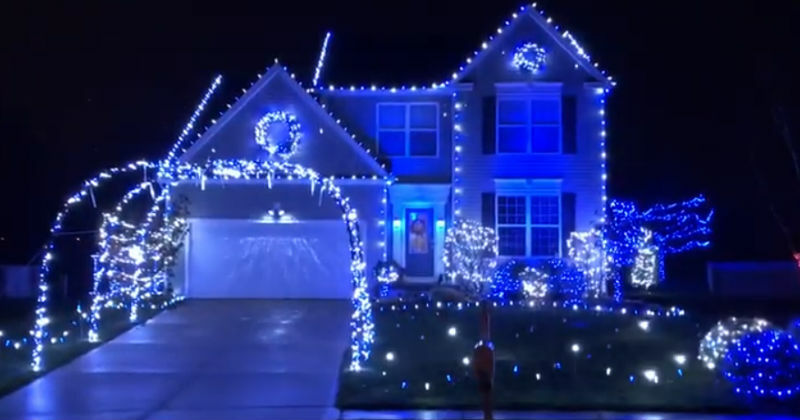 This beautiful blue and white display is located in Wadsworth and is the creation of Jeff Young. I had the opportunity to ask Jeff a few questions about his display. The picture above shows the history of the display. 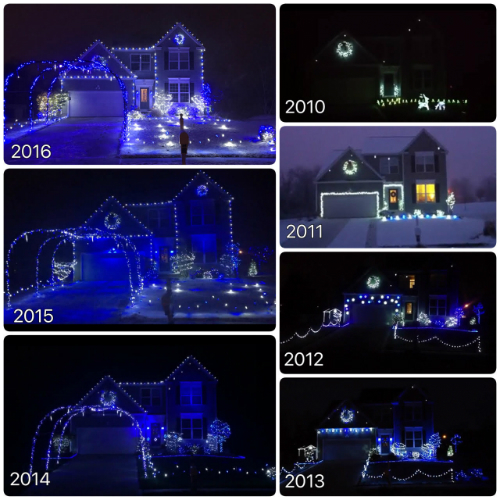 It started in 2010 with a few snowfall lights and it has grown to incorporate more and more items each year. With the blue and white lights, it reminds me of Elsa's Castle in the move Frozen. Fun Fact: Some of the lights used in the display can't be found in the United States. Jeff purchased them from a store in Canada in 2014. Jeff got his love of Christmas from his mother. Growing up, she always made Christmas special for him and his brother, even when it was difficult financially to do so. Now, Jeff is able to make Christmas special for all those who get to see his display. It takes him about 40 hours of work to put the entire display together. In the end, hearing stories from families who come to see the lights and knowing how much the kids enjoy it, makes Jeff's effort worth it. Fun Fact: The display consists 14,000+ blue and cool white LED lights. Because the lights are LED the display runs on just over 1000 watts. This is less than the amount of energy needed to run a small space heater! While it's difficult to pick a favorite part of the display, some of Jeff's favorite aspects include the snowfall tubes, driveway arches and the twinkle strobe lights. Watch the video above to see the lights in action! Ultimately, Jeff hopes that their display brings everyone else as much joy as it brings him. I'm quite certain that it does! Thanks for featuring our display! We hope everyone enjoys it!